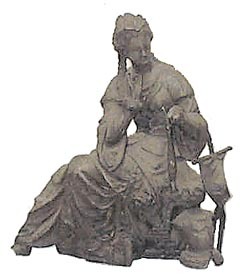 Ansonia Clock Co., top ornament, "No 1028, Queen", ca 1904. One hand, toes, tip of the object in her hand, are missing. No finish, dirty, black. Ly-Ansonia No.2767.